The Chile 100 Peso Liberty gold coin was first minted by Chile in 1926 without the intention of making it a circulation coin. This reality was even more pronounced when the peso was replaced by the escudo in 1960. 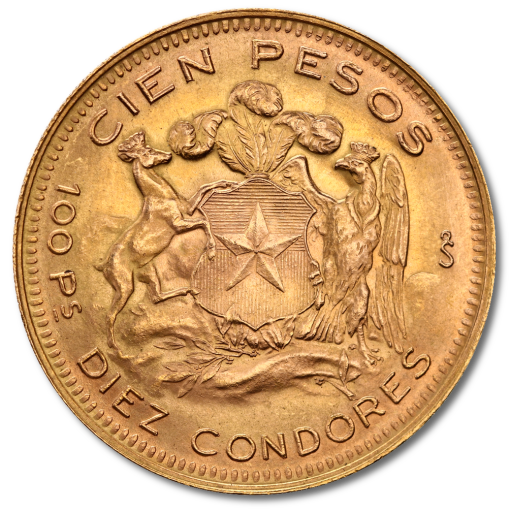 Between 1932 and 1980 the Chile 100 Peso Liberty gold coin manifested a steady production and is characterized as a modern gold coin. Other denominations produced by the Chilean government are the 20 Peso gold coins and the 50 Peso gold coins. The estimated recorded mintage for the Chile 100 Peso Liberty gold coin is of 540,000 coins. The total weight of the Chile 100 Peso Liberty gold coin is 20.34 grams, out of which 18.30 grams of pure gold the equivalent of 0.589 troy ounces of gold. It has a purity of 90.00% (900/1000) or 21.6 carats which makes it perfect for investors around the globe. We are selling the Chile 100 Peso Liberty gold coin which was minted in 1947 therefore on its obverse it is inscribed this particular year at the bottom of the Chilean gold coin. The obverse also depicts a laureate female head with coiled hair in the left position and dressed in representative Chilean dress. The words REPUBLICA DE CHILE are also present on the obverse in the superior semicircle of the gold coin. The reverse depicts the Chilean Emblem. The reverse of the Chile 100 Peso Liberty gold coin illustrates a shield that has in the center a five pointed star. The shield is supported by two crowned animals and the coin is written the inscription CIEN PESOS 100 Ps DIEZ CONDORES and the mint mark representing the Santiago de Chile Mint. Together with other denominations, like the 20 pesos and the 50 pesos gold coins, the Chile 100 Peso Liberty gold coin is a bullion gold coin addressed, in the first place, to investors and to people that consider gold as a safe mean to preserve their fortune and their wealth. The Chile 100 Peso Liberty gold coin is also suitable to people that have the means and have decided to make a profit from trading gold, with the recent situation when the gold price has steadily continued to increase. Chile and its issuing of gold coins can be an interesting case for many people and many collectors since it is a country that became one of Spain's main priorities. Spain wanted to conquer Chile in order to get a hold of its gold reserves. So Chile has produced a variety of gold coins which deserve our interest.